Pedro Vazquez had a big game this night in July 1991. He picked up two hits and four RBIs for the high-A Baseball City Royals. Those four RBIs, The Lakeland Ledger wrote, were a career high for Vazquez. In his four seasons as a pro, he had never knocked in more. Vazquez would get few chances to top that mark. His career ended with season's end. He never made AA. Vazquez' career began in 1988, signed by the Royals as an undrafted free agent out of his native Puerto Rico. 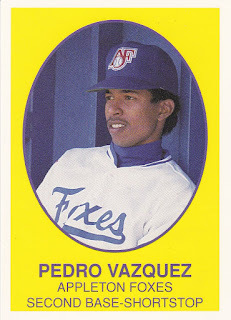 Vazquez' name is also sometimes spelled Pedro Vasquez. Vazquez started with the Royals in the rookie Gulf Coast League. He hit .216, knocking in 23 and stealing 10 bases in 63 games. He returned to the GCL for 1989. The infielder hit .235, with 17 RBI in 51 games. For 1990, Vazquez moved to single-A Appleton. His average sank to .211 in 66 games. He also had just nine RBI and no stolen bases. Vazquez arrived with Baseball City in 1991. He went 1 for 4 with a run scored in a July game. In a June game, he went 1 for 3, that one hit being his team's only hit on the day. Overall, Vazquez hit just .192 with Baseball City. He knocked in 15 and stole seven bases. It was his final year as a pro.